"Why don't we cycle around Brittany during the holidays?" That's a good idea. CAMPING PLUS BRETAGNE proposes you some ideas of easy walks to follow and accessible to all the family to discover Brittany by bike! 365 km long, the canal from Nantes to Brest crosses the Loire Atlantique, Ille-et-Vilaine, Morbihan, Côtes-d'Armor and Finistère. From lock to lock (there are 236 locks! ), you will discover an unsuspected architectural and natural heritage, the barges which sail silently on the canal, the calm of the green landscapes of Central Brittany. Our crush? The route of La Vélodyssée which takes the canal towpath between Rohan and Pontivy. A pleasant walk of about twenty kilometers through the valleys of Blavet and Oust. Among our campers' favourite cycling routes is the wild coast of Quiberon. From Erdeven, discover the peninsula of Quiberon by bike, the dunes perched above the cliffs, the mythical beach of Port Bara... A wonderful walk in the open air to explore a wild and preserved site unique in Brittany! To return, you can board the "Tire-bouchon", a small train that serves the small stations between Quiberon and Auray during the summer. Practical! South Finistère by bike...from Pointe du Raz to Bénodet ! If you have chosen Finistère for family cycling, you will not be disappointed! More than 500 km of cycle routes are available to you. The coastal cycle route that leads from the high cliffs of the Pointe du Raz to the pretty fine sandy beach of Bénodet is surely one of the prettiest walks in southern Finistère. On the way, you will discover the bay of Audierne, the great lighthouse of Eckmühl or the fishing ports of the Bigouden country before joining the Brittany Riviera. 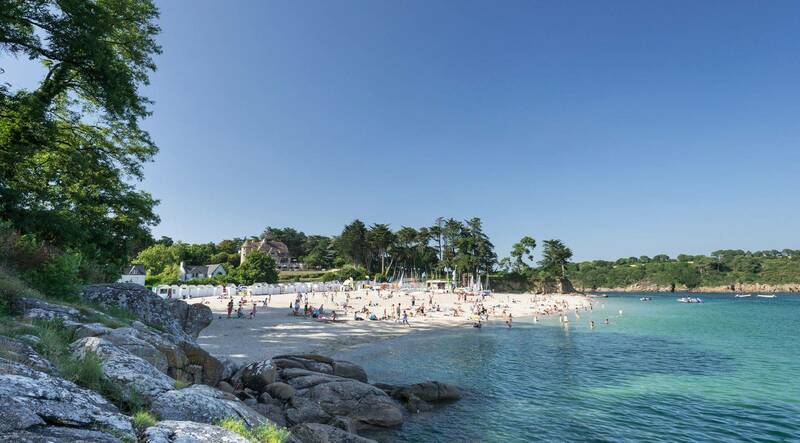 From Tréguier in the Côtes-d'Armor, the historic capital of Trégor, the Tour de Manche takes you to the Jaudy estuary and the Port Blanc archipelago before arriving at Perros-Guirec on the Granit Rose coast. After a stop on the beach, direction Ploumanac'h, famous for its colorful rocks with unusual shapes, then the Pointe du Castel in Trébeurden, dotted with small secret coves. You want more? And why not follow the Vélodyssée®? The longest cycle route in France starts (or ends) in Roscoff in northern Finistère and crosses Brittany along the Atlantic to the Basque Country!